At the beginning of kindergarten, I sent little love notes to school in my daughter’s lunch. Since she couldn’t read, I wrote them in code and pictures. I was worried about school last year since she didn’t know anyone there. It was a big, new experience for us in kindergarten. She had been enrolled in a preschool that was not in district and had no established friends going into the school. Just in case she was having a hard day, I wanted to remind her how much she is loved right. Needless to say, as the school year went on, she made friends and relaxed. She enjoyed school and was excited to go. I relaxed too and stopped sending notes in her lunch box. She asked me about it every now and then, reminding me that I was being a big slacker – which is always awesome coming from a 5-year-old. 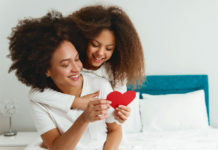 However, as a parent you probably know that the 30 minutes before you have to go to school are the most hectic of the day. In that craziness, love notes were left out. 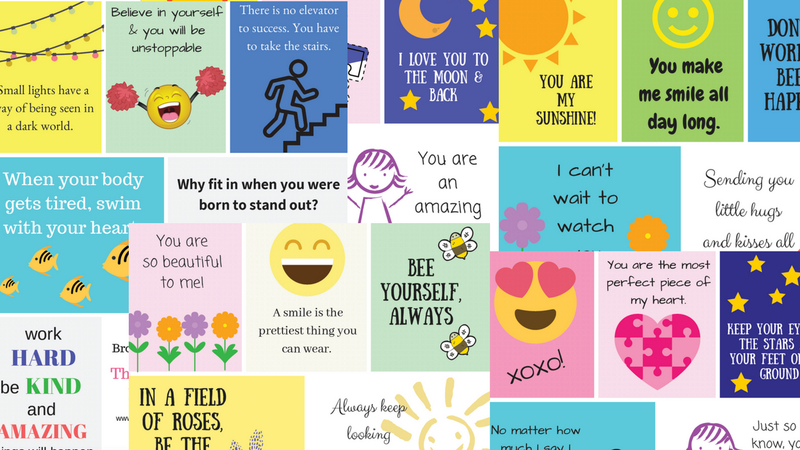 To make life easier I’ve compiled a few printables for myself and for other parents wishing to send their kids sweet sentiments in the middle of the school day. 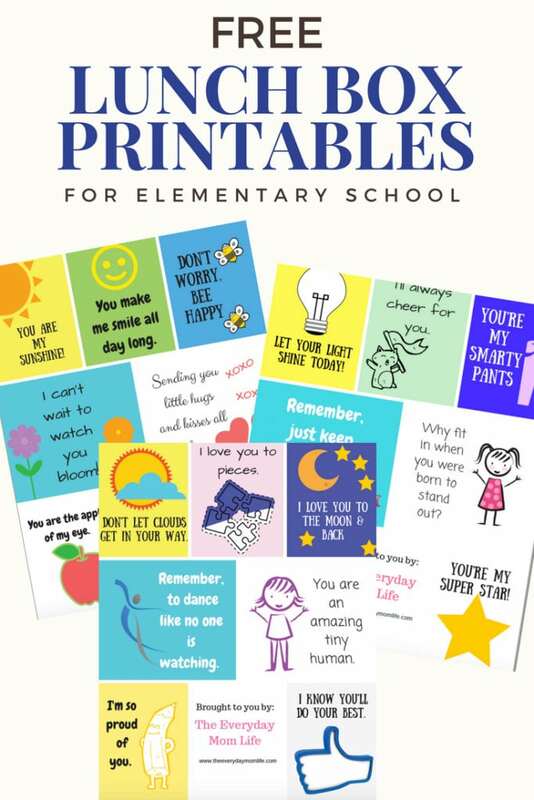 I created the first set, which I would classify as being for younger elementary school students, last year and this year I added an additional set of printables for older kids. They would be perfect for tweens and possibly even tweens. There are 21 in each set and then I’ve also added some blank ones so you can add your own messages really quickly if you want to make a more personal note. 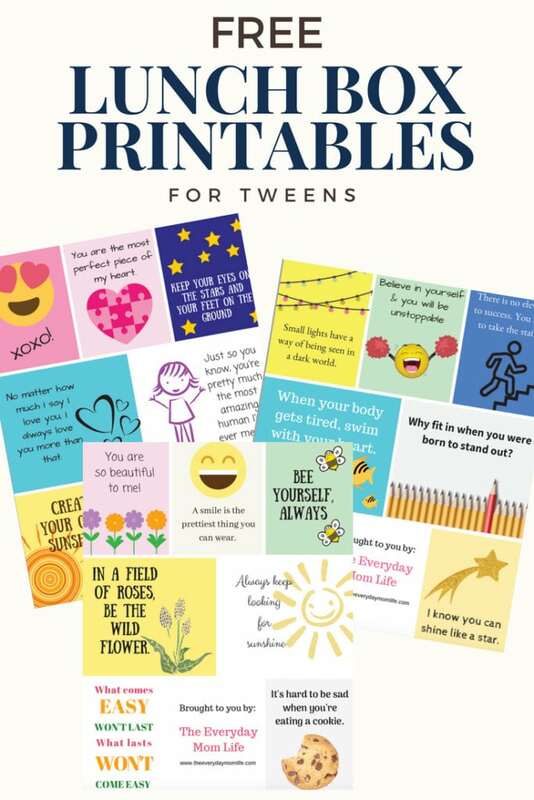 You can find both sets of printables in the Cards or For Kids section of the Printables Page here. Click here for more kid experiences. Aww, these are so cute! I don’t have kids but I should print them out to put them in my husband’s lunch box haha. I used to love when my mom put notes in my lunch . . . it’s really a mood booster! These printables are so colorful and useful. It’s such a great way to keep the kids happy and motivated to eat all their lunch! This is a great resource! I always liked sending the kids to school with little notes in their lunches. These printables should be perfect! What an awesome lunchbox notes! The kids would appreciate the adorable notes when they eat lunch. I can’t wait to print these out and surprise them! I remember my dad leaving us little hand written notes when I was little. They totally made my day! What a cool printable idea! I have a dedicated pile of post-it notes in my junk drawer which will welcome this hiatus. Thanks, these are awesome and my boys will love them! How did we ever make it through childhood? These are so fun! I should really start putting more effort into my son’s lunch box and add little notes every once in awhile. I’m sure it would be a nice surprise for him. These are so cute. I always loved leaving a special little note for my kids in their lunch boxes. My kids would love these fun quotes! I am going to have to print these out for the first week of school! I think these are great. I’m going to save this for when my girls go back to school. They usually eat school lunch, but sometimes eat home lunch when they don’t like what’s for school lunch. These are going to be great for them. These are so cute! My oldest starts kindergarten this year and I know he would love something like this in his lunch every day. These are precious. And such an awesome idea. And not just for kids…I’m sure adults would appreciate a surprise note in their lunch sometimes too. What a cute idea! I always loved getting a note from my mom in my lunchbox. It made lunch seem even more special! 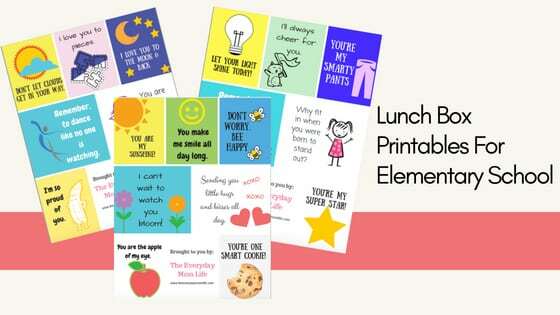 Those are great lunch notes to put in their lunch boxes! What a great idea! Oh my gosh, these are so fun! My kiddos would love these little notes in their lunches! This is really an awesome idea! 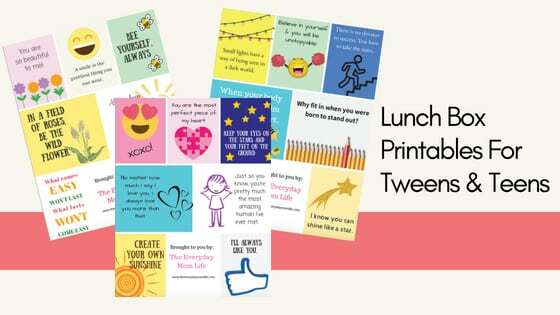 Love those cute printables! Such cuteness. Leaving notes at my girls lunchboxes has been something I’ve always done. This printables are wonderful. These lunch box notes look awesome! I do not have any kids in school, but as a former educator, I know notes like this make kids feel extra special each day! This is so cute! I’m totally passing it on to my friends with kids going into kinder this year! Aw this was my favorite thing about bringing my lunch to school! These notes are so cute and always made me smile when I was a kid! Oh my, these are the absolute sweetest notes. Can I go back in time, send this post to my mom and get her to put them in my lunchbox. Although I used to make my own lunches so I could probably print them for myself lol. 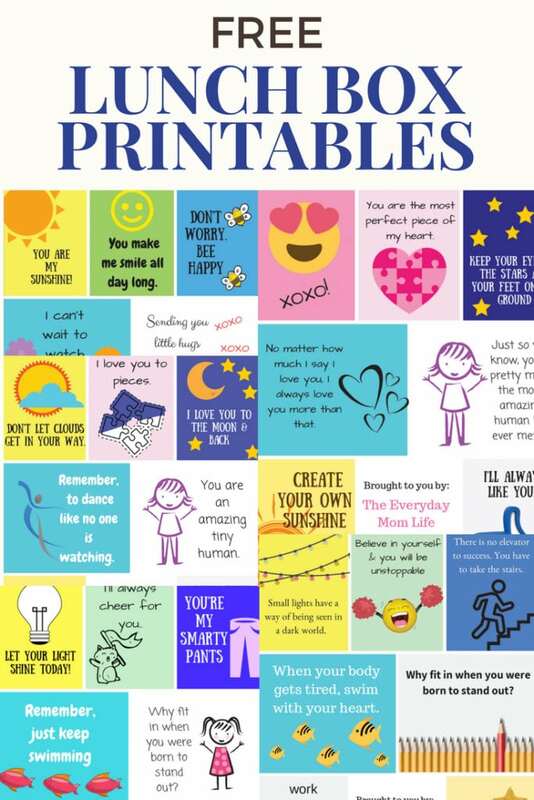 I love printables that make you smile. These are precious. These are some of the cutest I have seen! But, I can only find the tween ones to download. Are the early elementary ones still available? Thanks!